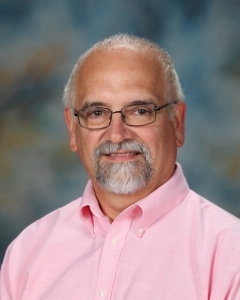 Dr. Harold Carl joined the SCA faculty in 2016 to teach high school Bible, including the dual credit World Religions class. Dr. Carl’s passion is teaching – and he has lived that as a music education major in college, a pastor, a seminary professor, a college professor, a university chaplain, and a Sunday School teacher. He has taught internationally in Korea, China, and Hong Kong. He has published and presented research on Christology, the doctrine of the trinity, John Wesley, and cults. Dr. Carl loves caving, SCUBA, and working on electronic projects. He plays jazz and blues guitar and jazz trumpet every chance he gets. He has a General Class Ham Radio License, is a member of SATERN (Salvation Army Team Emergency Radio Network), and is a National Weather Service Skywarn Trained Observer. He is also a certified Red Cross disaster relief volunteer. Dr. Carl and his wife Gwen have a son and daughter-in-law in Olathe who have blessed them with a granddaughter.